In this day and age we can’t afford to be spendthrifts. Being prudent and frugal can never be a bad thing. While many of our life expenses can be minimized or even eliminated, a vast majority of people will need some form of transport. But owning a car can be a major expense. How do we ensure that we aren’t bleeding money because of our automobile? We think that simple car maintenance can save you massive amounts of money in the long run, especially when handled by experienced car-care experts. Luckily, we’ve come up with a quick and easy list of tips on how you can maintain your car so you can avoid more problems in the future. The most basic and most critical advice we can give you for not only maintaining your car but also maintaining you, your passengers, and other motorists and pedestrians’ overall safety is to drive as safely as possible. This means always driving under the speed limit, cutting out distractions, and being aware of your overall surroundings, among others. This significantly lowers the risk of accidents happening which can eventually lead to higher costs to pay. Always remember to buckle up. Again, very basic but also very easy and practical to do – keep your car covered when not in use. Car covers can protect your car from foreign objects that can scratch or dent it such as small tree branches, bird droppings, and the occasional kid on a bike. It also keeps your car protected from the rain, snow, and sunlight that can harshly affect your car’s paint coating. If you can keep your car in a garage, all the better. Keep your windshields clean and non-obfuscated to ensure maximum viewing capability. Leaving dirt, dust, and gunk to accumulate can lead to more damage especially if any dinks, splits, or cracks are present. You should also have your windshield wipers replaced once they are worn out. Have your windshield checked out by one of our auto mechanics at Kings Brothers Collision. We’ll keep your windshield spotless and fully operational. You’ll thank us later. Here’s a good one. Switch up your front and rear tires every thousand miles or so. Uneven weight distribution and other factors contribute to their wear-and-tear. Changing between them now and then will balance out their structural integrity and greatly increase your tires’ lifespan. Have them properly aligned as well to have better control of your car’s steering. Keeping your tires’ pressure at the recommended standard will also keep them performing at an optimal capacity. Keep your rims and hub caps clean and free from any objects that could have stuck to ensure your tires aren’t constricted. Get a full check-up from a professional repair shop for anything you could easily miss. As much as we’d like to save on money, sometimes hiring an expert can save you more moving forward. Have your engine, battery, belts, spark plugs, coolant, brakes, and other fluids inspected to determine their longevity and whether or not some of them might need replacing. Make sure all your lights are functioning and that none are missing. Not only do we want to prevent accidents, but we don’t want any unnecessary fines that could have been easily avoided had we only taken the necessary steps. King Brothers Collision will be happy to help you in any way we can. As the old saying goes, “An ounce of prevention is worth a pound of cure.” In our haste to achieve immediate results, we sacrifice quality and end up regretting it in the end. We are often blinded by our eagerness to “live in the moment” that we forget that the future is written by present actions. Keep your future safe by being mindful in the present. We urge you to give us a call at King Brothers Collision for any and all car maintenance needs. 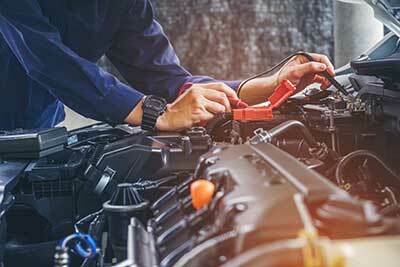 Our highly-skilled auto mechanics will be more than happy to give your car a full run-through. Give us a call at 313-534-8090 (Redford) or 734-744-8557 (Livonia), or feel free to request for a quote here.